There was important science news this week. Two research groups announced they have found a particle which looks very much like the Higgs Boson Particle. You can read about it here and here. I understand that this is an important discovery- a once in a lifetime event for physicists. But I’m no physicist, so I went looking for articles to help me understand what these physicists have found. Here is a graphic to help explain things. Here is the first part of a multi part video series to help. Here is a Q and A with a physicist from Cambridge. One of the most interesting things about science is that scientists can make predictions about what ought to be and then go looking for “it”. 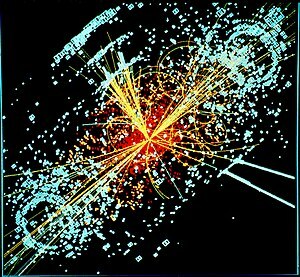 Forty eight years ago, Peter Higgs wrote a paper where he suggested that what come to be called the Higgs fields and the Higgs boson must exist. This week, two groups have most likely “found” what Higgs predicted. That we can understand the universe, to the point of looking at what is and predicting what then must be, is absolutely amazing. If you are wondering, “so what?” This video from Berkeley Lab provides some answers to that question and to the question what if this new particle upsets what we think we know? If you are wondering whether this discovery end the science and religion debates, here is what Philip Clayton thinks. And here (from the Clayton article) is how Steven Colbert resolves the science and religion debate. Cross posted at Presbyterian Bloggers. Posted in Science and Religion. Tagged Higgs boson, Peter Higgs, Physics. I’m actually humored by how fast this debate has exploded like a “big bang” so soon after the purported discovery of the so-called Higgs boson. It’s funny how the scientists involved in the project have only said that it is “Higgs-like”. Again media is trying to make something a certainty that is not a certainty. Can’t we wait until all the facts are in? What will happen is if they discover that this is not the Higgs boson they were expecting then all the religious people will say, “we told you so” and feel justified in their criticisms of science. I loved the Lawrence Krauss interview with Colbert. Even though Mr krauss is an athiest I find it interesting how his theories prove my belief in the existence of God and how the universe was formed – which is something that Colbert pointed out at the end of the interview. Like Krauss said, “there is no need for God” which I believe to be true because God just IS. People claim a “need” for God because of their experiences in this life. Have we forgotten why God created humanity to begin with? Are we so filled with self-importance that we have shrunk God down to our own expectations and desires instead of living up to Gods expectations and desires? It seems that the science of Physics is constantly expanding our ideas and understanding of this marvelous universe that we call creation. It seems to me that we should not limit the possibilities. I know that because Lawrence Krauss exists in this universe that God loves him and has even inspired his thinking whether he acknowledges it or not. Could it be that Krauss may possibly have an even larger view of God than what most people do which is why he refuses to try and provide justification for God? I don’t know – just thinking. Great post. way to keep us thinking. 🙂 Have a great weekend. Thanks for your comments. I put the video from the Berkeley Lab physicist because he does address the “what if this isn’t the Higgs Boson or if it doesn’t fit the standard model” question. I liked the Krauss interview as well. I know it is from a comedy show but within the limits of the genre, there was some serious discussion. And they modeled (again within the limits of the the genre) conversation about an area of disagreement which was lively, respectful and friendly. Physics does push us to have a big, big view of God and an appreciation of the marvelous almost unimaginable creativity of God. Now that the announcement has been made, isn’t more confirmation needed? After all, that’s how science works. Thanks for the infographic! They appear to have a high degree of confidence in their results, but yes more work to do. Something to keep the next generation of physicists busy! Agree, but verification goes a long way. more on this topic? I’d be very grateful if you could elaborate a little bit more. Bless you! Thanks for reading and commenting. Someday I will return to the subject of physics, I just don’t know when!